Oh hey, did somebody say slow cooker meatloaf? 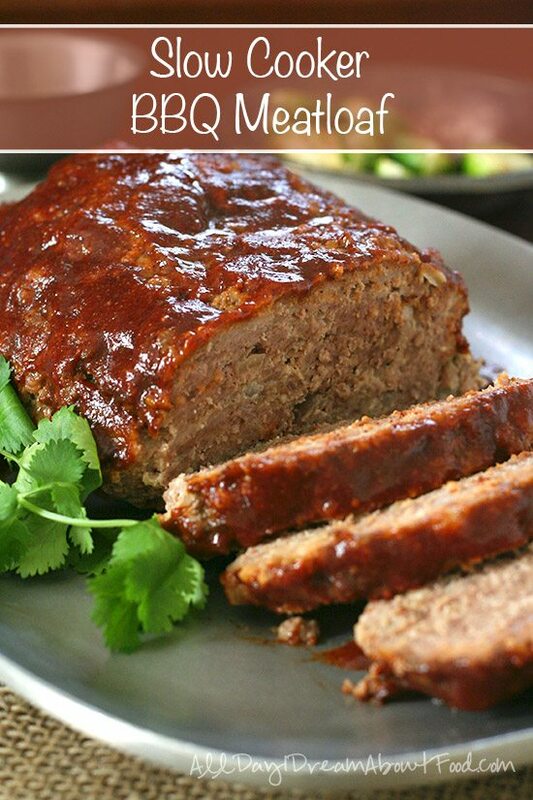 Yes, this low carb BBQ meatloaf recipes is made in your crockpot and is so tender and juicy, you will never make it any other way again! I recently had a plea from a reader to add more dinner recipes to All Day I Dream About Food. I do actually have quite a number of main dish recipes, but there’s no question that the sweets and baked goods outweigh those options. Judging from the high sweet ratio, you might think that my family was mostly fed muffins, cakes and cookies for every meal. While I admit to having resorted to ice cream for dinner for myself on rare occasions, we really do eat proper meals the vast majority of the time. And I can sometimes be as creative a cook as I am a baker. So why not get photos of all those tasty meals and throw them up here for you good folks to peruse? Because like any mother trying to get dinner on the table, it’s usually 6pm, it’s getting dark out and I am frantically cooking while also fielding the demands of three hungry and attention-seeking kids. Ain’t no time for food styling and pretty photos with all that chaos. My family of five is a hungry lot and they’re not going to let me hold up dinner for something as silly as taking pictures. 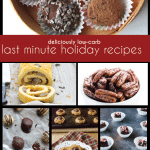 Still, I love to bring you low carb recipes of all kinds and dinner certainly deserves its due. And I actually have a great number of meals where I’ve struck out on my own and created something so tasty that I know I need to put it on the blog. I find myself making notes after dinner, knowing I will have to make the recipe in the middle of the day at some point so I can get some appetizing photos. Thankfully my children don’t seem to mind their food warmed up at the end of the day. And the reality is that when I do this, I find myself so much more relaxed when dinner time rolls around. All I have to do is turn on the stove or oven to rewarm the food. Really, I should make a habit of cooking dinner in the middle of the day and rewarming it; it would certainly reduce the stress of the evenings! This recipe is actually perfect for creating stress-free evenings, as long as you have a good slow cooker or crock pot. You may have to do a little advance prep work if you plan on using my Homemade Sugar-Free BBQ Sauce. But you can make a big batch when you have extra time (feel free to skip the whiskey if that’s not your thing), and it freezes really well. Or you can purchase a commercial sugar-free barbecue sauce such as Nature’s Hollow (xylitol-sweetened). Then all you have to do is mix and shape the meatloaf and set your slow cooker to low for 6 hours. Even if you’re at work all day and your crock pot turns itself off, you can gently rewarm when you get home. And you will end up with just about the moistest meatloaf you could ever hope for, with very little fuss or muss. It’s a winner, my friends. You can thank me later. 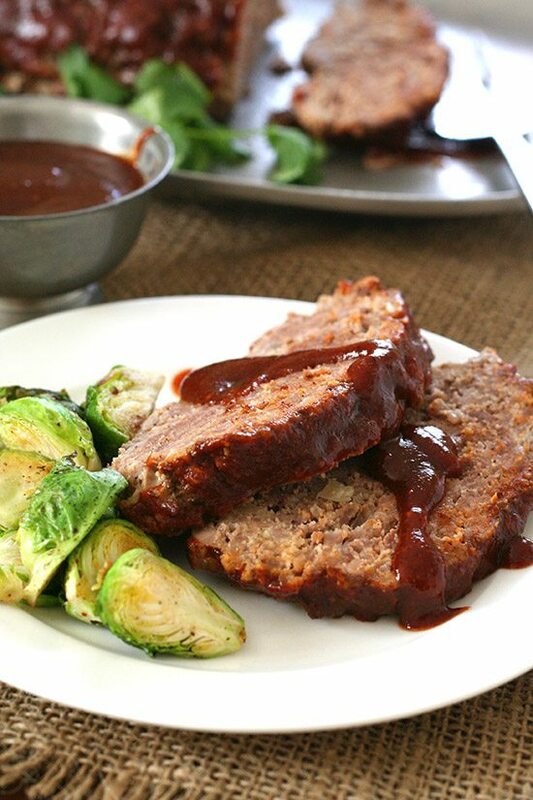 Low carb BBQ meatloaf made in your slow cooker. Dinner is stress-free, grain-free and sugar-free. And it's delicious! On a large sheet of tinfoil, shape mixture into loaf roughly 5 x 9 inches. Lift foil by edges and place in a 6 quart slow cooker. ***Cooking tip: if you can't use lean ground beef and pork, make sure to put a rack or some balled up tinfoil in the bottom of your slow cooker. Otherwise, your meatloaf will be swimming in grease by the end of cooking. *with the homemade BBQ Sauce. Carb count will differ somewhat with purchased sauce. ooh and MINE does not mind the warm up either!!! Sounds good and will absolutely put it on my menu – one thing inexperienced cooks might not be aware of is that I assume you’ll need to use very low-fat 90/10 ground beef (or else elevate the loaf somehow in the slow cooker – either on a rack or some balled up aluminum foil) – otherwise it’s going to be swimming in grease. I can add that in, that’s a good tip. In my house, prepared food ready to warm up is like money in the bank. I am going to make your BBQ sauce without the whiskey…do you have the nutritional analysis for the sauce alone? I expect that the carbs from the alcohol won’t change the count much, would it? Many thanks for these recipes. They will be valued both for dinner and next day for sandwiches! BBQ Sauce Nutritional Analysis: Serves about 12 (2 tbsp per serving). Each serving has 3.16 g of carbs and 0.76 g of fiber. Total NET CARBS = 2.4 g.
Yum! I can’t wait to mke your BBQ Sauce, as well! Love the idea of more non-sweet recipes! Thanks, Carolyn! Me too! 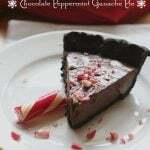 I don’t eat many sweets and would love to see more main dishes. I think many of your readers are like me, we have been able to make lower carb main entrees and side dishes, but are stumped by dessert. That is why I keep coming back, you have such great ideas for desserts! That is not to say your entree and side dishes are not appreciated but keep the sweets coming, please! Haha, never fear. There will never be a shortage of desserts on this blog! Sounds amazing; bookmarking to feature in my round-up! This is just what I have been looking for. Just me, so I can have left overs to freeze. Yummm……Thanks, Carolyn. This looks amazing! 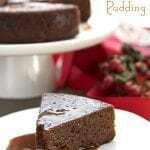 Thank you for sharing these recipes on your blog! Sounds good. My slow cooker is small for meatloaf. Wonder if I can slow cook it in the oven with a covered baking pan? I bet you can. Not sure of the time and I might put it on a rack with a little water in the bottom of the pan for extra moisture. Looks delish – will definitely be making this one! Thanks for all your hard work and doing all the experimenting for us, Carolyn! I can’t wait to whip up this delicious recipe in my crockpot! Just remove “LEAN” meat. make sure the fat ration is at least 20% saturated fat!!!! You will be blown away with the taste and how the meat melt in the mount. And it do not raise blood sugar. And thx for the receipt. If you make it with higher fat meat, your meatloaf will be swimming in grease at the end. The fat does not stay in it much as you cook. But the choice is yours. I’ve been missing meatloaf since I’ve started avoiding sugar – thank you! In regards to the crockpot BBQ meatloaf recipe. What could I use as a substitute for the almond flour? My son and I both have allergies to almonds (actually most nuts). Could I possibly use something like flaxseed meal or possibly coconut flour? Coconut flour would make it too dense. Try ground up chia seed or even ground sunflower seeds. Okay thank you. I didn’t even think of chia seeds! I will give it a whirl. Thanks again. If I’m wanting to make this recipe but not worried about the low carbs, could I use regular flour instead of almond flour? No, use bread crumbs, not flour. This might sound like a silly question, but when you use the foil to lower the loaf into the crock pot, do you leave it in there? Thanks for all the great recipes, sweet and otherwise they are always great! Yes, leave it in there. It will make for much easier clean up! Is the tin foil just for clean up purposes or cooking elevation? I usually use slow cooker liners for clean up. I’m usually not one for Meatloaf but this looks fab, FAB! I know this changes the recipe, but do you think it will work with ground turkey? I’m not sure if it will fall apart. Turkey is definitely drier so I might add a few tbsp a ground chia seed and a bit of broth to make it more moist. Thanks so much. Even my father-in-law who doesn’t like meat loaf really liked it! Would you use the same amount of ground up chia seeds as the almond flour? Had this for dinner tonight and it was PERFECT! I did not have ground pork so I used half of a roll of sausage (with no MSG or sugar!) Everything else I left alone! We will make this again and again! Thank you! Your BBQ sauce is a keeper, too… no alcohol added but it was still great! Eileen – you could also use crushed pork rinds with a little grated parmesan and seasonings as a breading instead of the almond flour. I also season my meat with a little BBQ sauce while mixing, salt, pepper, seasonings of choice, gives a nice flavor. You could do “italian style” with a bit of tomato sauce and italian seasonings, with some tomato sauce on top and melt a little mozzarella on top at the end, or do the BBQ and melt some cheddar on it. Hi Carolyn, love the meatloaf recipe, but I have a question, Is the carbs too high, I love the fact that there is no sugar (being diabetic), this is exactly what I need. Also the flour would flaxseed be okay for a sub? Carbs too high? At 3.51 g per serving? No, I wouldn’t say so. And yes, flax would make a fine sub. I tried to find the post on Facebook so I could comment but I can’t locate it. I just wanted to let you know that I made this tonight and it was delicious! Such a great way to make meatloaf, especially in the summer. Thank you for the recipe! This recipe looks great! Quick question – how would long and what temp would I cook this at in an oven? We don’t have a slow cooker. Thank you! Not entirely sure but I think you could follow the directions for any meatloaf of about the same size for oven baking. My slow cooker doesn’t turn off automatically. I leave for work at 7:20 am and don’t get home until 4:15 pm. I’m afraid it will dry out cooking for that long – anyone have any suggestions? Best suggestion is to not raise it up on foil or anything and then let it sit in its own juices and make sure you only cook it on low. I bet it will end up okay. The BBQ sauce is a keeper. I thought the meatloaf could have been more moist. I have read the comments. Adding the sauce to the meat I’m sure would help. We used a high fat ground beef. We kept removing the grease from the cooker. Maybe we should have left it in the pot? Yes, I left the grease in the pot. I would have stated it in the instructions otherwise. I’d like to make your low-carb barbecue sauce, but I don’t have any chipotle powder. Do you think the recipe will turn out if I sub in a canned chipotle pepper or two? I’ve never used ground chipotle, so I don’t know how the ground/canned versions compare taste/texture-wise. Thanks for your help. Okay, here’s an update for anyone who might want to know this – I made the sauce with two very small canned chipotle peppers (they were about 1×1.5 inches) instead of the chipotle powder. I added them when I pureed the tomato mixture in the food processor and followed the rest of the recipe as written. The sauce turned out good, but was spicier than I expected for only adding those two little chipotles, lol. I may adjust that next time I make it, but overall the sweetness and other flavors of the bbq sauce were just right. Has anyone tried making this in the oven yet? I’d really rather do it in the oven than in a slow cooker. I substitute cooked quinoa with ancient grains for the almond flour. I have also added small amounts of very finely chopped green pepper. Lastly, some chopped mushrooms are nice in this. I cooked them in the oven in muffin pans (pregreased). They are then in small servings that freeze well. I call them meat muffins. Do you think I could substitute hemp hearts for the almond flour? I have a lot of it and not many ways to use it. Um…maybe? I’ve never tried it. Might be best to grind them first. I not only use BBQ sauce IN the meatloaf but we like sliced green olives in it too. Somehow, it just tastes really good. And sliced thin the next day it’s like olive loaf. If you cut the recipe in half then would it be half the cook time as well?? No, it may take less time but certainly not cut in half. Maybe an hour or so less? Is there a reason you use ground beef and pork? The reason I ask, is that I’ve just received a great deal of ground moose meat, and I’d love to try it out in this recipe, but I don’t know what kind of changes that could cause. Since moose is pretty low fat, would I need to add anything for moisture, like the people who are attempting to use ground turkey? 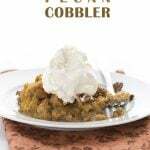 And by the way, I just adore using my crockpot any time that I can, so this recipe is amazing! I can’t wait to try it out and see how the moose does. Just moisture and flavour. If moose meat is low fat, then you have to make that fat up somehow. I’d add some bacon fat or lard in there. Is there a difference in switching the almond flower for coconut flower? 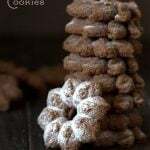 I would love to make this today and can’t find almond flower anywhere. Use only about 1/3 the amount of coconut flour. It’s very powdery and absorbent. Sounds like a great recipe..Can I use Parchment paper to line crockpot? Do you place the tin foil in the crock pot? I want to know if I can make this as a freezer crock pot recipe? 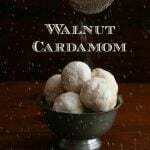 REALLY interested in those to make ahead low carb. Not much out there – need more like this. Don’t want to do all the cook ahead stuff. Do you mean prep it ahead and then freeze the loaf and then put it in the crockpot later? I can’t see why not although you will need to de-frost it. This meatloaf is outstanding. I’ve made it three times in the last month, LOL. Today I finally made the Chipotle Whiskey BBQ Sauce. It is the PERFECT accompaniment to the meatloaf – takes it to a whole new level. Thank you! No, you simply shape the meatloaf and put it in. I’m confused how to “ball up” the tinfoil to put in the bottom of the crock pot. Could you post a photo? Thanks. I don’t have a photo but just take two good size squares of foil and crumple them into something that will hold the loaf off the bottom of the cooker. This is definitely a must-make! Looks really good! 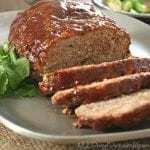 This meatloaf is pure comfort food! Perfect for fall weekends! I’m obsessed with using my slow cooker! Having dinner ready at the end of a crazy day is the only way I stay sane!! This looks fantastic! 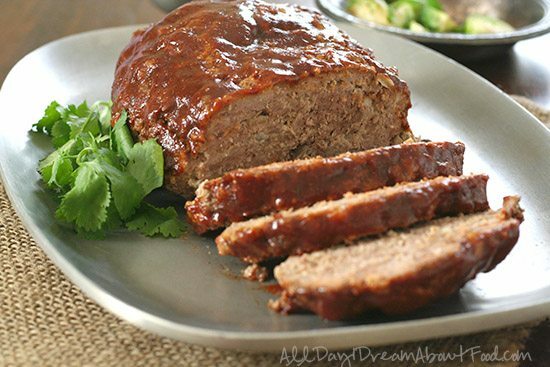 I love that this meatloaf can be made in a slow cooker and is great reheated!!! Sounds like the perfect meal for busy nights! This is one of my favorite weeknight meals. Not too dry, but very moist. My family loves this! At the end it says: Slice and serve with the remaining BBQ sauce. Can i use ground deer meat only? It might be a bit on the lean/dry side but I can’t see why not.